Haxerboi Ransomware is a new piece of malicious software you might encounter if you do not have security software installed on your computer. At the time of research, it was not a prevalent infection, but this might change soon because, according to researchers working at pcthreat.com, anyone having its builder can customize it and start spreading it with the intention of obtaining money from users. This builder is distributed as a .rar archive consisting of hackerBoi.exe, ddos.dll, and haxerterminal.dll. Cyber criminals are allowed to enter their own BTC wallet address and set the desirable size of the ransom. Since the Haxerboi Ransomware builder is accessible quite easily, the popularity of this threat might soon increase and thus you might find it installed on your computer. Are you reading this article because you have already encountered it? You must remove this infection from your computer as soon as possible because its presence might even bring more problems to you. We have not found any entries created by this threat in the system registry. 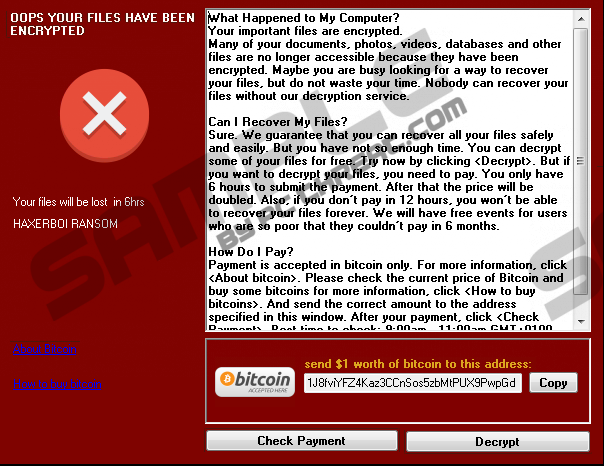 In addition, it seems that it does not drop any additional files on victims’ computers, so we believe that you will find the removal of this ransomware infection quite easy. Of course, you should still first read this report before taking any action. Haxerboi Ransomware does not differ at all from many other ransomware infections even though it is known to be customizable malware. It has also been designed to lock files on victims’ computers so that cyber criminals could extract money from them easier. The sample tested by our malware researchers did not encrypt any files, which suggests that the ransomware infection might still be in development, but it does not mean that it will not lock your personal files either if it ever slithers onto your computer. Ransomware infections are designed to lock all the most valuable files, including documents, pictures, music, and more. If you see your files having the .hexerboi extension appended to them, it means that they have all been locked. It is not the only sign showing that the entrance of Haxerboi Ransomware was successful. If this infection slithers onto your computer and locks files on it, we are sure you will also find a window displayed on your screen. It contains a message explaining what has happened to all personal files. In addition, users realize what they need to do to get their files back after reading the entire message. That is, they need to send money to the ransomware author. Since Haxerboi Ransomware is one of those malicious applications that can be customized, the size of the ransom this infection demands from users might vary. We are only sure for one thing – the decryption tool that could unlock files on your computer will not be cheap. You should not invest your money in it because there are no guarantees that you will receive it from cyber criminals or that it will unlock those encrypted files for you. The only free way to get data back is to restore it from a backup. Make sure you do this after the Haxerboi Ransomware removal. Even though Haxerboi Ransomware was not a prevalent infection at the time of research, it does not mean that users cannot find this threat on their computers. Without a doubt, the majority of users who find Haxerboi Ransomware installed on their computers keep their systems unprotected. If you have not encountered this threat yet, you can still prevent it from entering your computer. You just need to stop opening attachments from spam emails, clicking on suspicious links, and downloading applications from dubious websites. In addition, our security specialists recommend keeping reputable security software enabled because some threats are sneakier than others and, because of this, it might not be easy to prevent them all from entering the system without the special tool. You must remove Haxerboi Ransomware from your computer as soon as possible if you are sure it is the one responsible for locking data on your computer. Of course, you will not unlock any of your files by erasing it from the system if they have already been encrypted. If you feel that you need some help with the manual Haxerboi Ransomware removal, you should use our manual removal instructions – find them below this report. The other way to delete malware from the system is to perform a scan with a powerful antimalware scanner. Close the ransomware window by pressing Alt+F4 simultaneously. Open Explorer (press Win+E on your keyboard). Open %USERPROFILE%\Downloads (type it in the URL bar and press Enter). Delete all suspicious files you have downloaded recently. Perform a system scan with a diagnostic scanner to make sure there are no malicious components left. Quick & tested solution for Haxerboi Ransomware removal.